Today was a fun packed day at our house. Hazel did not take a nap, so it was also a long day. We started our morning with an early play date, though both kids slept in so it was later than usual. During which we played inside and outside. 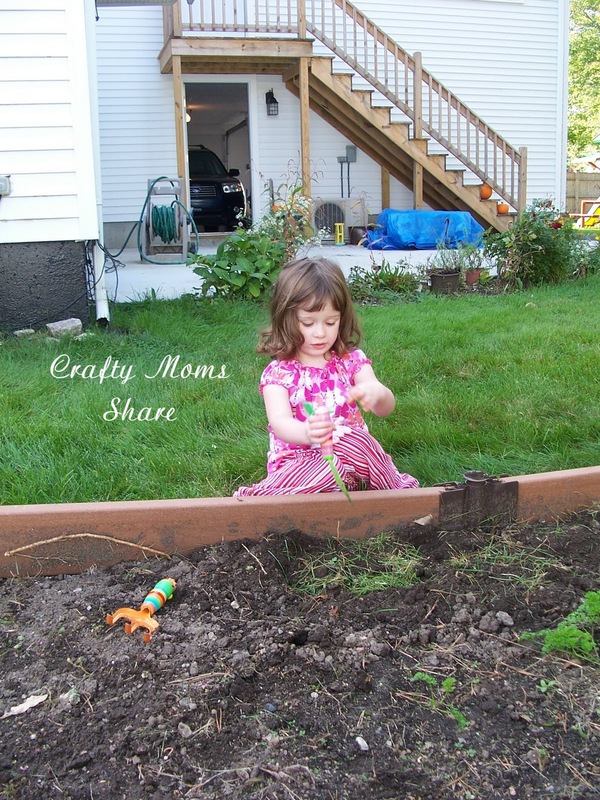 Hazel wanted to take a walk with her little wagon so she could collect nature treasures. Of course to her all the leaves are treasures so we didn't get very far. After our playdate Hazel and I headed over to the Farmer's Market. I promised to buy her some apple cider doughnuts and some apple cider. It was the last week of the Farmer's Market in our town, so it was our last chance. Then we came home and had lunch and tried to nap. I almost fell asleep, but apparently Hazel didn't want to and decided she wanted quiet time today instead. Quiet time is at least half an hour of alone time in her room. She can play with her dollhouse or read her books in there, but shouldn't call me unless it is an emergency. She is getting much better at this. I feel it is important for each of us to have a little down time in our day and a change of pace as well as time to be alone. Then we started to do some crafts. (Well actually I guess we continued to do crafts since we had done some before our playdate this morning.) 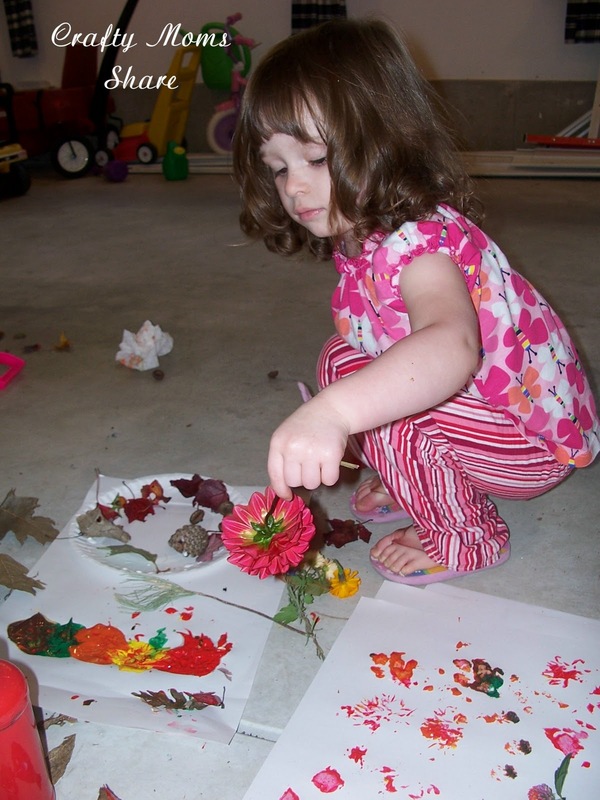 These crafts however were done in the garage. I would have done them outside, but after our Father's Day experience outside crafts do not work for us. 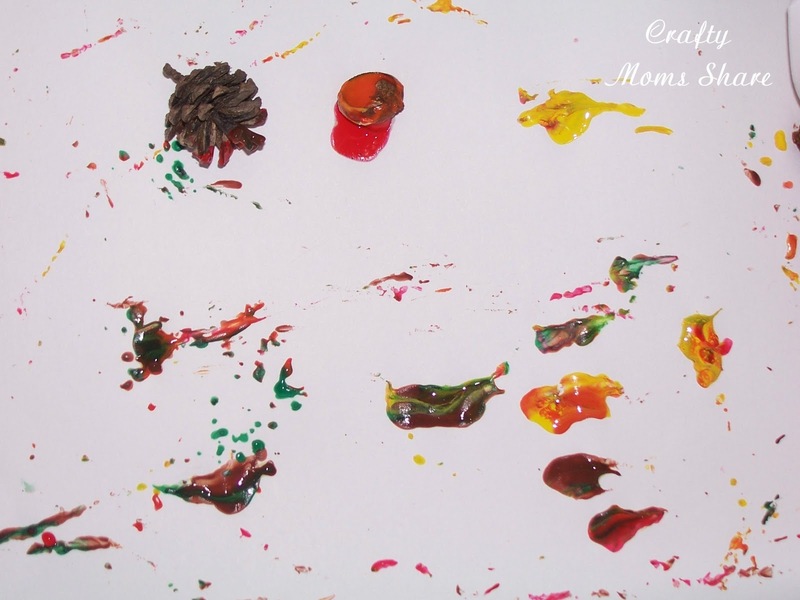 We started with the acorn painting similar to what I saw on Tippytoe Crafts. However I didn't look to see what they did in awhile, so I went with my own intuition. 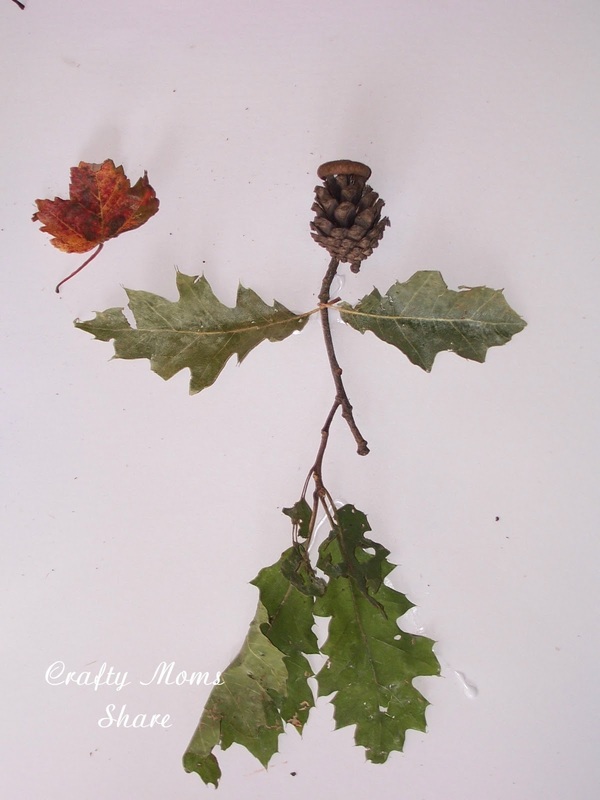 We also did not have many complete acorns so we threw in some pinecones. 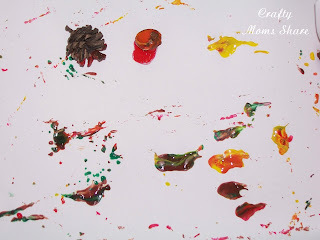 We put a piece of white paper in a shirt box and then dipped acorns, acorn caps, and pinecones into fall colored paints. The result was interesting. 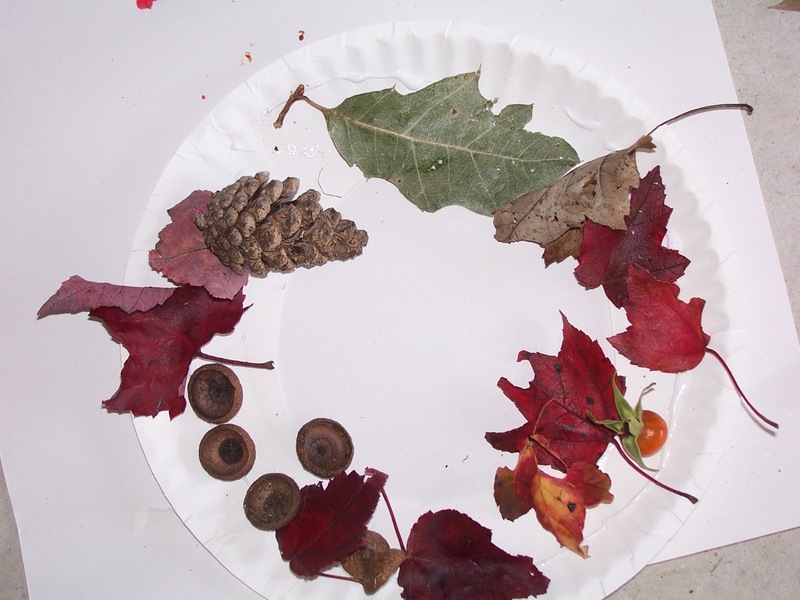 Next we took some of those leaves, pinecones, flowers, acorns (well mostly caps) and glued them onto paper and a cut paper plate wreath. 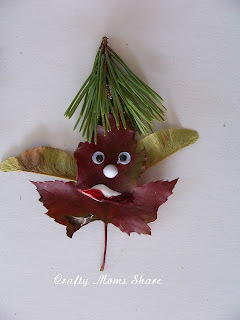 Then we decided to make leaf people which we then made into leaf fairies. 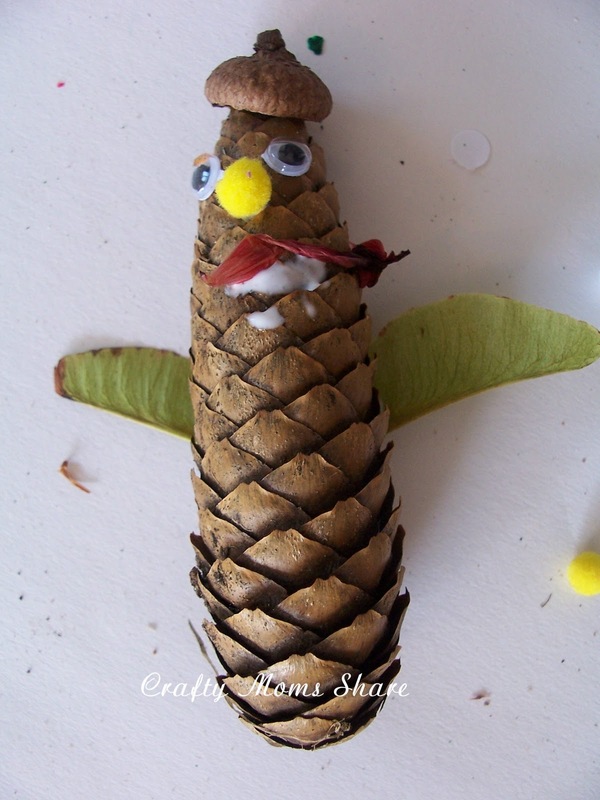 Oh, and Hazel decided to use a pinecone instead of a leaf for one of them. Then Hazel really wanted to go dig in the garden, so I let her. 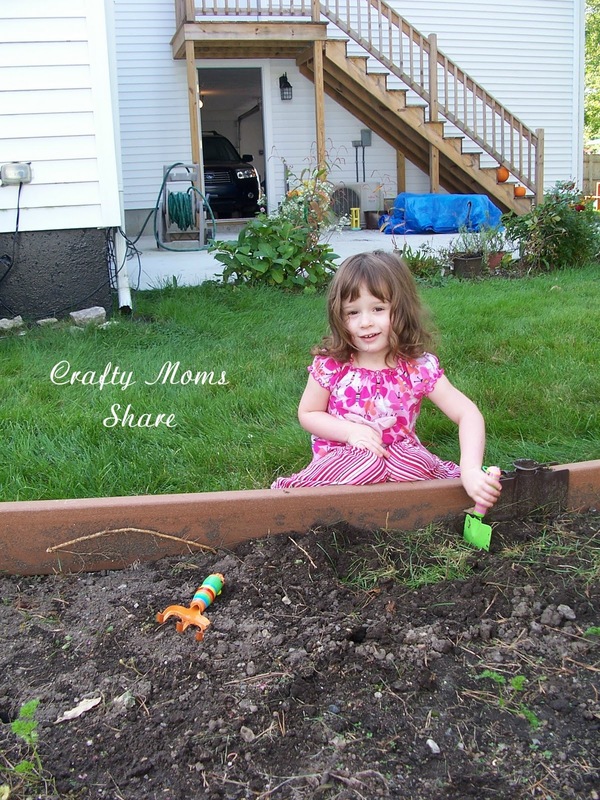 Yesterday she got to dig to help plant fall bulbs. And I was very glad she wasn't worried about getting dirty like she use to be. After digging, we decided to try some more painting. 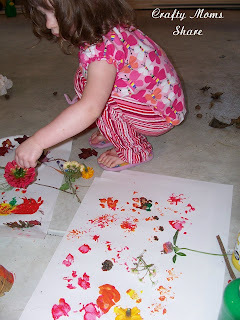 This time we used flowers, leaves and anything we could find as our brushes. We had a great time. Hazel got sick of the flowers, etc. and decided to use her fingers and hands. While she had her hands in the paint I pulled out more fall colored paper and got her to do her handprints for handprint turkey cards for Thanksgiving. I will stash them away for a bit. Then I hosed her off. 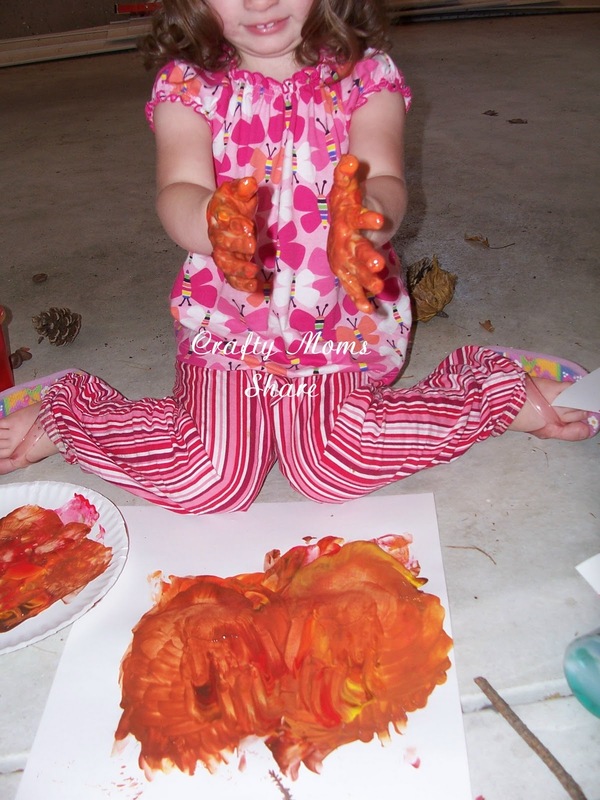 She somehow ended up with orange paint in her hair. It was definitely a bath night tonight. 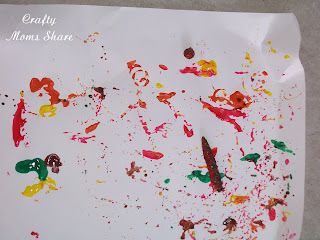 We did some more painting and crafts, but we will safe those for another post. 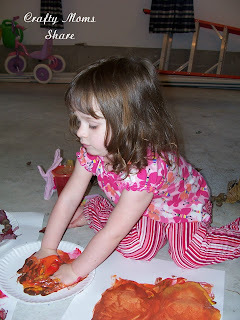 I figured while she was already dirty to do footprint paintings too. They are our Halloween cards. 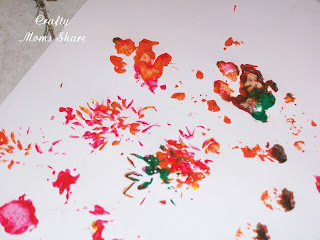 I'll share our Halloween crafts tomorrow. 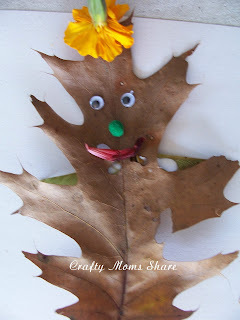 I love your nature crafts! Those leaf fairies are so cute and I like the way the flower paintings turned out. Very cool! Thanks for sharing! 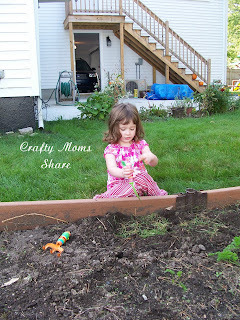 It's so fun to be able to take things from the outdoor and use them for projects! 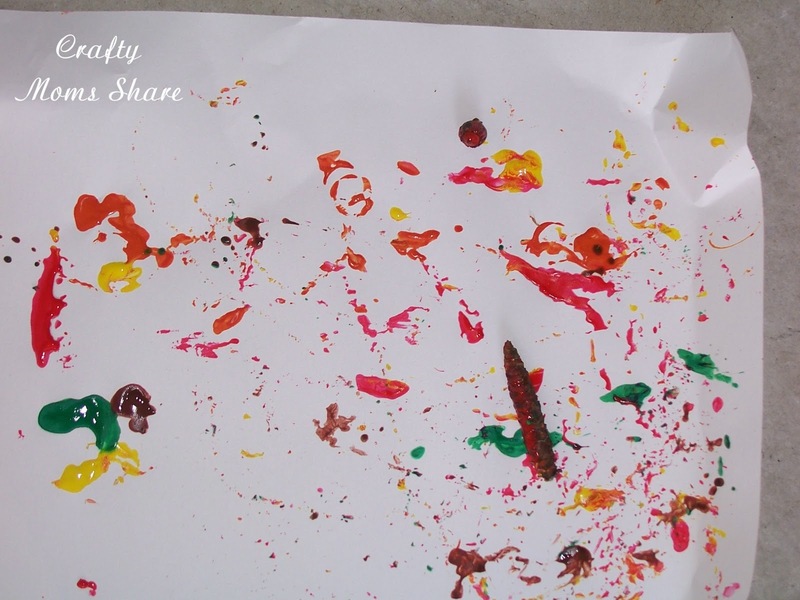 What a great way to connect science and art! Thank you for sharing on The Sunday Showcase!